e-con Systems is a product company focused on OEM products with the sole motive to help customers to speed up the time to market. Founded in 2003, e-con Systems has been a pioneer in the OEM Cameras and Computer on module products. Camera modules include standalone MIPI camera modules and USB cameras. e-con Systems notable contribution has been in the launch of the World’s first UVC Compatible USB 3.0 camera. e-con Systems was also the world’s first standalone Stereo camera supplier. System on modules include processors from NVIDIA, NXP(Freescale) and Texas Instruments. These Computer on modules have support for Android and Linux. i.MX6 SOM – eSOMiMX6 is a high performance system on module based on NXP/Freescale i.MX6 Quad/Dual/DualLite/Solo ARM® Cortex™-A9. The i.MX6 SOM has i.MX6 CPU running up to 1GHz – Quad Core, DDR3L SDRAM configurable up to 4GB and eMMC flash with capacity configurable up to 32GB. The eSOMiMX6 System on Module also has Wireless LAN and Bluetooth module. This iMX6 SOM supports Android, Linux. eSOMiMX6 System on Module is aimed at reducing the time-to-market for our customers by making use of the stabilised and ready-to-market iMX6 modules in their applications. eSOMiMX6PLUS is a high performance and low power Computer/System-on-Module based on NXP semiconductor’s i.MX6 processor with the basic peripherals in a small compact form factor. The eSOMiMX6PLUS has i.MX6 Processor running @ 1/1.2GHz with QuadPlus/DualPlus Core ARM™ Cortex-A9 and DDR3L SDRAM configurable up to 4GB. It also has the optional peripherals ICs like Gigabit Ethernet PHY, Wi-Fi/Bluetooth module and eMMC flash which configurable up to 64GB. This eSOMiMX6PLUS is currently powered by Linux and Android. eSOMiMX6-micro is a high performance micro system on module based on NXP/Freescale i.MX6 Quad/Dual Core ARM® Cortex™-A9 in an ultra small form factor of 54mm x 20mm with 10mA in suspend current. This powerful micro SOM can be used in compact medical devices, drones, wearable technology gadgets. 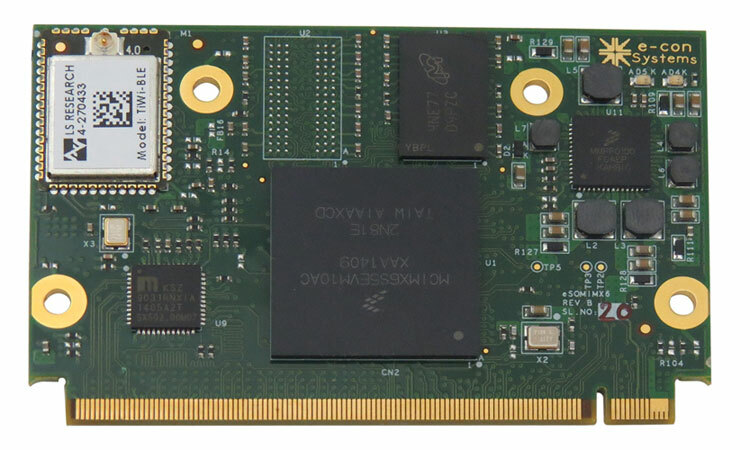 eSOMiMX6-micro has iMX6 CPU running up to 800MHZ – Quad Core and Dual Core ARM Cortex-A9, 2GB LPDDR2 and 4GB eMMC FLASH (expandable upto 32GB). eSOMiMX6-micro System on Module also has Wireless LAN and Bluetooth module. This iMX6 Micro SOM supports Linux and Android Marshmallow*. The i.MX6 Micro System on Module (eSOMiMX6-micro) is aimed at reducing the time-to-market for our customers by making use of the stabilized and ready-to-market micro iMX6 modules in their product. See3CAM_CU135 is a 13MP fixed focus 4K USB camera board with good low light performance and iHDR support. This 4K board camera is based on 1/3.2″ AR1335 CMOS image sensor with advanced 1.1µm pixel BSI technology from ON Semiconductor®. See3CAM_CU30 is a 3.4 MP UVC-compliant Low Light USB camera boardbased on AR0330 sensor from ON Semiconductor®. This Low Light Board Camera is backward compatible with USB 2.0 and supports compressed MJPEG formats at frame rates equal to USB 3.0. This sensor enables a superior low light performance. It has a dedicated, high-performance Image Signal Processor chip (ISP) that performs all the Auto functions (Auto White Balance, Auto Exposure control) in addition to complete image signal processing pipeline that provides best-in-class images, videos and the MJPEG compressions. Tara can be used by customers to develop their Stereo Camera algorithms and also by customers who would want to integrate Stereo Camera in their product design. e-con Systems 3D Stereo camera is ideal for applications such as Depth Sensing, Disparity Map, Point Cloud, Machine vision, Drones, 3D video recording, Surgical robotics, etc. e-CAM57_MI5640_MOD is a Omnivision camera module (MIPI) with 70mm Flex Cable featuring OV5640 image sensor. This 70mm camera module with OV5640 streams HD @ 60fps, Full HD @ 30fps & 5MP @15fps. Any processor system like i.MX6, OMAP4430, OMAP4460, that has a MIPI CSI-2 can directly interface the e-CAM57_MI5640_MOD. e-CAM52A_MI5640_MOD is a 5MP MIPI camera Module that features OV5640 image sensor. This MIPI CSI camera module streams HD (720p) @ 60fps and full HD (1080p) @ 30fps. Any processor system like I.MX6, OMAP4430, OMAP4460, OMAP35x, AM37x, DM37x that has a MIPI CSI-2 interface can integrate the e-CAM52A_MI5640_MOD. e-CAM30_HEXCUTX2 (HexCamera) is a multiple camera solution for NVIDIA® Jetson TX1/TX2 developer kit that consists of six 3.4 MP 2-Lane MIPI CSI-2 camera board and an adaptor board (e-CAMHEX_TX2ADAP) to interface with the J22 connector on the Jetson TX1/TX2. 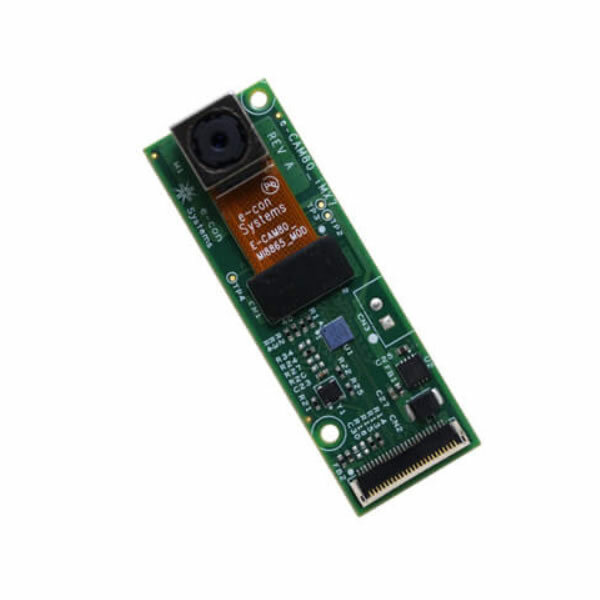 Each camera is based on the camera module e-CAM30_CUMI0330_MOD, 1/3″ AR0330 color CMOS image sensor from ON Semiconductor® and integrated high performance Image Signal Processor (ISP). All these six cameras are connected to the e-CAMHEX_TX2ADAP adaptor board using 30 cm micro-coaxial cable. The e-CAM30_HEXCUTX2 streams 720p(HD), 1080p (Full HD) and 3.4MP @ 30fps in uncompressed YUV422 Format in both synchronous and Asynchronous mode. e-CAM131_CUTX2 is a 13 Mega pixel 4-lane MIPI CSI-2 fixed focus camera board for NVIDIA® Jetson TX2/TX1 developer kit. This camera is based on 1/3.2″ AR1335 CMOS image sensor with advanced 1.1µm pixel BSI technology from ON Semiconductor® and an integrated high-performance image signal processor (ISP) that performs all the Auto functions (Auto White Balance, Auto Exposure control). It has S-mount (M12) lens holder which allows customers to choose and use the lens according to their requirement. This camera can be directly connected to camera connector(J22) on the NVIDIA® Jetson TX2/TX1 developer Kit. e-CAM131_CUTX2 is exposed as a standard V4L2 device and customers can use the V4L2 APIs to access this camera and control the same. NileCAM30 is a first GMSL camera in the NileCAM camera series. NileCAM30 is a two board solution containing the camera module and Serialzer board. This camera is based on AR0330 CMOS image sensor from ON Semiconductor®. The NileCAM30 comes with 3 meters or 15 meters coaxial cable with FAKRA connector. NileCAM30_USB is a 3.4 MP GMSL Camera for USB3.1 Gen1. NileCAM30_USB is a four board solution containing the camera module, Serialzer, Deserializer and USB baseboard. This camera is based on AR0330 image sensor from ON Semiconductor®. The NileCAM30_USB comes with 15 meters coaxial cable with FAKRA connector. NileCAM30_TX2 is a 3.4 MP MIPI GMSL Camera for NVIDIA Jetson TX2/TX1. NileCAM30_TX2 is a four board solution containing the camera module, Serialzer, Deserializer and TX2/TX1 base board. This camera is based on AR0330 CMOS image sensor from ON Semiconductor®. The NileCAM30_TX2 comes with 3Mtrs/15Mtrs coaxial cable.